More than three times the information of the First Edition! 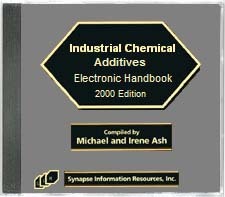 The Industrial Chemical Additives Electronic Handbook-2000 Edition is a comprehensive, up-to-date source of information on functional additive chemicals and materials used in the formulation of the full spectrum of worldwide chemical products. An additive can be a primary ingredient that forms an integral part of the end products basic characteristics or a secondary ingredient that functions to improve performance and/or durability. Since the publication of the First Edition of this Handbook, our data collection and processing methods have kept pace with changes in information technology. The result is a radically expanded edition that stretches the definition of the word handbook as it spans three oversized volumes. However, because of the widespread use of the first edition, it was important to maintain the paradigm of centralizing functional chemical additive information. This section provides an alphabetical listing of trade name chemicals used as additives. Each entry includes the manufacturer's name; chemical description; its detailed functions and applications in all aspects of industry; physical properties such as form, m.w., density, solubility, boiling points, cloud points, flash points, pH, freezing points, activity, toxicology, storage, precautions, etc. All major chemical components of trade name products are alphabetically listed in this section. Detailed information is given on each chemical component (CAS, EINECS/ ELINCS, UN numbers, synonyms, physical properties, toxicological and environmental properties, etc.) and these entries are followed by a listing of the trade name additives that are either equivalent to the chemical or contain the chemical as one or more of its ingredients. More than 60,000 categories of industrial chemical functions including those listed below are described in more detail than the first edition by presenting the categories in an index format and subdividing the functions by application areas. Both trade names and chemicals are included in this robust section. An alphabetical listing of the international chemical manufacturers of the trade name products and chemical components is provided in this section. Each entry includes branch locations and contact information. Wherever possible, telephone, telefax, toll-free 800 numbers, E-mail and Internet addresses, and complete mailing addresses are included for each manufacturer. Chemical Formula Index contains the formulas of the chemicals in this reference alphabetically ordered by their constituent elements. Note that in some cases there will be more than one chemical for each formula because many chemicals have the same formula with positional variations (e.g., o-, m-, p-).